The next update to indie smash hit Minecraft will include weather systems like rain for all your wolf-dampening purposes. Minecraft has quite a lot of well-deserved boasts to its name. It's currently earned creator Notch a cool $33 million, it has adorable blocky wolves, and it has an incredibly catchy song created by The Escapist's own Miracle of Sound. (Seriously, I can't stop listening to this). One thing it doesn't have yet, though, is weather. 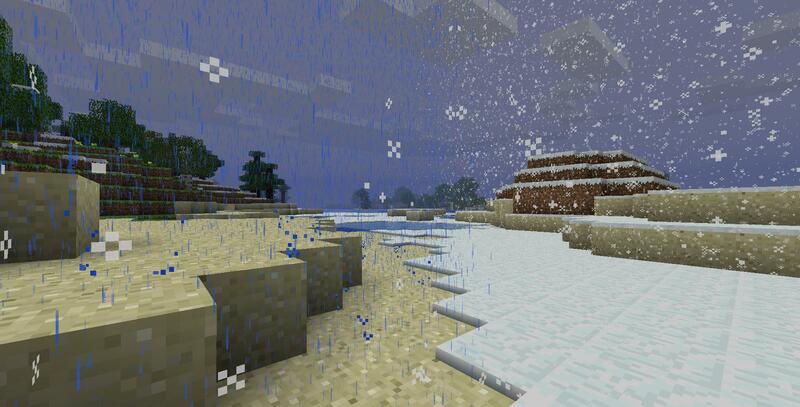 That's about to change: According to the game's mastermine Notch, beta update 1.5 will add rain and snow to the world of Minecraft. He also included a picture of what it might look like on the border of two Minecraft biomes, which just doesn't look natural at all. What will the weather actually do? That's a trickier question, and Notch and Mojang haven't quite decided all of the effects it could have on the game. Rain will water crops, put out fires (but not lava) and make wolves get wet, and it also might flood small holes. No word on what snow does, but hopefully it freezes Creepers, or something like that. Oh, wait! Maybe you can pack it into snowballs and throw it at people! That'd be fantastic. There you go, Notch, have that idea for free.